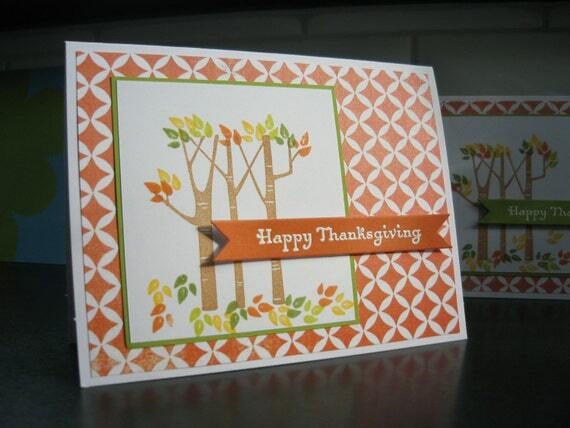 Send good wishes with this cute Thanksgiving card! Front: card is on white cardstock. A birch tree and leaves have been stamped on a white mat. "Happy Thanksgiving" has been embossed on an orange banner. This has been adhered with foam tape. A pretty piece of orange patterned paper has been adhered to the card. Outside: there is a stamp of the company who made the stamp and my etsy shop address. Cards measure 4.25 X 5.5 inches, and come with white envelopes. Because of the foam tape, you may have to pay extra postage when mailing them.